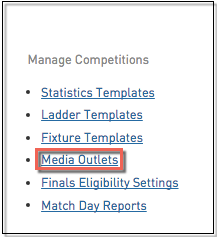 Media Outlets is a list of contacts of who receives the Media Reports that are sent out at scheduled times. You can have as many Media Outlets as you need and set which outlets receive which reports. 1. Click the Cog on the right hand side and then Settings. 2. Under Manage Competitions, click Media Outlets. 3. From the Media Outlets page, click Add on the right hand side. 4. Fill out all necessary information and click Update Media Outlet. 5. Once successful, the below screen will appear.